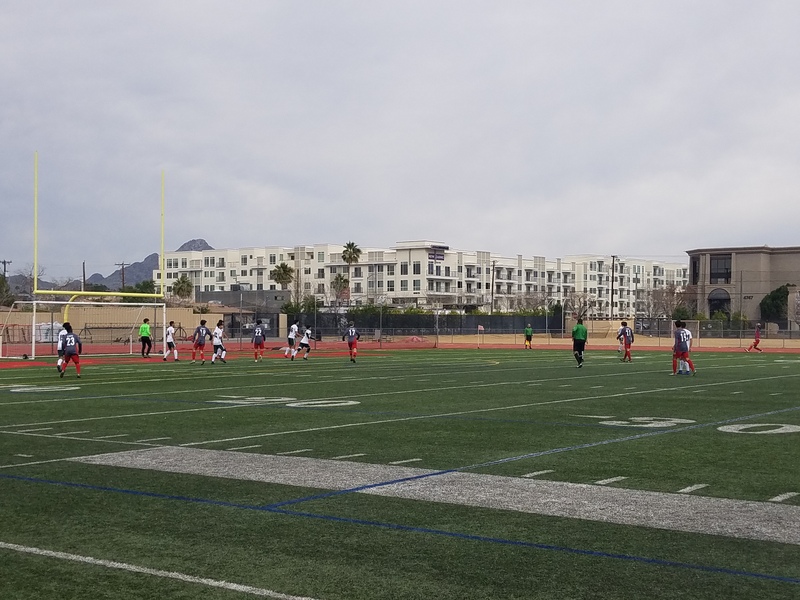 Brophy's boys varsity soccer team beat the San Luis Sidewinders, 4-1, in the opening round of the 6A state playoffs on Saturday at Brophy. San Luis came out aggressive, scoring 37 seconds into the game and going up 1-0. The Sidewinders got a breakaway attempt in the third minute but senior goalie Nick Rau made a diving save in front of the net. The save was one of Rau’s two saves. After the opening minutes of the game Brophy started to stabilize overall as a team. The Broncos started to control the pace and kept the ball in the Sidewinders third of the field. Slowing down the game helped the Broncos control the pace of the game the rest of the way. A penalty in the 18th minute led to a penalty kick by junior defender Anthony Hidalgo, who kicked the ball into the left corner of the net to tie the game. Captain and junior midfielder Francesco “Case” Montanile had the game-winning assist off a corner kick in the 34th minute. Montanile’s corner kick sailed to the front of the net before being headed in by junior defender Logan Abele. Scoring right before the half completely shifted the momentum in Brophy’s favor. “The confidence, the everything just came back,” Montanile said. “So, getting that goal after Logan (Abele) scored there. It definitely put us back into good spirits again." Montanile also scored in the beginning of the second half in the 49th minute on a goal where he scrambled down the right sideline and pulled the goalie from the front of the net. The kick just got past San Luis goalie Martin Sanchez into the goal. Montanile lead the Broncos in scoring with 16 goals this year. Brophy wore down San Luis over the course of the game. The Sidewinders' inability to prevent offensive pressure in their third of the field was the team’s downfall. They were outshot by Brophy, 17-9. Sanchez had 11 saves while Rau only had two. San Luis head coach Jesus Rojas was proud of his team (7-5, 1-3) despite the loss. Brophy’s stout defense was able to limit scoring chances after the first three minutes as the team was able to get continued pressure on Sanchez the rest of the game. Brophy (11-1, 3-1) will face Red Mountain (10-1-1, 4-0-1) at home in the 6A quarterfinals at 6 p.m. on Tuesday. Red Mountain advanced by defeating Trevor Browne, 5-4.